The producer of the next Legend of Zelda says that gamers should expect a surprise at the next E3, because the new game will overhaul the series' formula. While every "proper" iteration in the mainstay Nintendo series like Mario and Zelda throws its own little twist into the franchise, the games tend to be very formulaic - not that there's anything inherently wrong with that if the formula works. 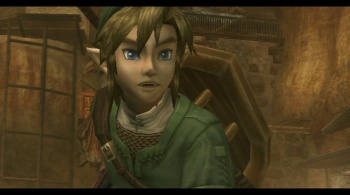 Last July, Shigeru Miyamoto shocked millions when he said that the new Zelda wouldn't be "radically different" from the series' roots, leading many to believe that the game would be about a young elfin boy in tights invading temples, getting the Master Sword, a bow, a grappling hook and bombs, and then fighting Ganon(dorf). Maybe he would be cartoony and on a boat, or maybe he would be more realistic and turn into a wolf, but it would stay generally the same. "It is something we used to talk about with Mr Miyamoto, and he and I agree that if we are following the same structure again and again, we might not be able to give long time Zelda fans a fresh surprise ... [s]o we have been trying something new in terms of the structure of the Wii version of the new Zelda game this time. I am really hopeful that people will be surprised with the changes we have implemented for this Wii version." Aonama confirmed that the team was operating with the goal that the game would debut at next year's E3 extravaganza: "I hope that we can show you something at the E3 show next year and it is something we are hopeful will be surprising." So which is it, Nintendo? Is it a "surprising" overhaul of the franchise, or is it something that isn't "radically different"? You're mixing your messages a bit here, don't you think? Maybe Link will trade Epona out for a go-kart this time around.